Being a part of the Science faculty at Parramatta Marist where a collaborative approach to interdisciplinary learning is the centre of the everyday life of the school, a constant focus to review and rebuild projects has always been paramount. Staff and students regularly work on rigorous PBL projects creating a PBL culture in the school. Utilising the expertise of teachers in the school, effective practices are shared through UnConferences, collegial discussions, Professional Learning Teams and ‘Pedagogy in Practice’, a collaborative approach of schools in the Westmead Education Precinct connecting and sharing ideas on current practices. 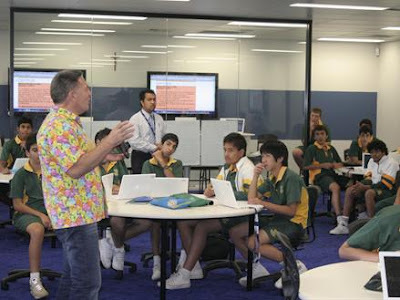 Parramatta Marist has embarked on an Interdisciplinary approach in the PBL classroom since 2015, wherein methodology and language from more than one discipline is integrated in a PBL project to examine a theme, issue or solution to a problem. The Science projects integrated with Physical Education/Technological and Applied Studies (TAS)/ IST have a real world context where students engage in the teaching and learning working through rigorous Formative and Summative Tasks. Concept Maps, Concept Cartoons, Digital Story, Reflection Journals, Experimental Design using Design process, creating prototypes of end products and using IPad apps to present information are some examples of Formative Assessments. Students play the role of scientists, developers, advisors, or website designers to create products that simulate the real world. eg.The Nature Vs. Nurture debate, a Summative task for Year10 students allows students to express their arguments on the topic: “A person’s development is predisposed in his DNA”. Other examples include: ‘creating a sustainable school garden design’ integrated with TAS, Designing a Smart Home (Science & IST), Information Brochure on Impact of Chemical substances in Drugs (Science & PE), Development proposal for a Sustainable Community, to name a few. The STEM education approach integrates and analyses interdisciplinary connections within the Science, technology, engineering and Maths to develop solutions to challenges and real world problems. Public exhibition of student work/ presentation ensures projects are authentic and nurturing the 4C’s – Communication, Collaboration, Critical thinking and Creativity. Striving towards authenticity teachers envisage to create projects where the work has a direct impact in the real world or is used in the real world. Team teacher meetings are mandatory while implementing projects to address issues within the project or student collaboration. Involving students in the development of projects/critical friends’ protocols will enhance student interest and participation. Project Calendars/deadlines can be made flexible whenever the need to elicit high quality student work is found to be compensated by unexpected events. Giving students and teachers the time to revise and reflect on their work will foster deeper learning to go beyond the 21st Century Skills. According to John Larmer, A Proven Approach to Rigorous CLassroom Instruction, project based learning is not the same as "doing a project.” For example, projects that may have a viable place in the classroom, they are not and cannot be classed as PBL. Larmer states that these projects are detrimental to students’ learning and should be avoided. 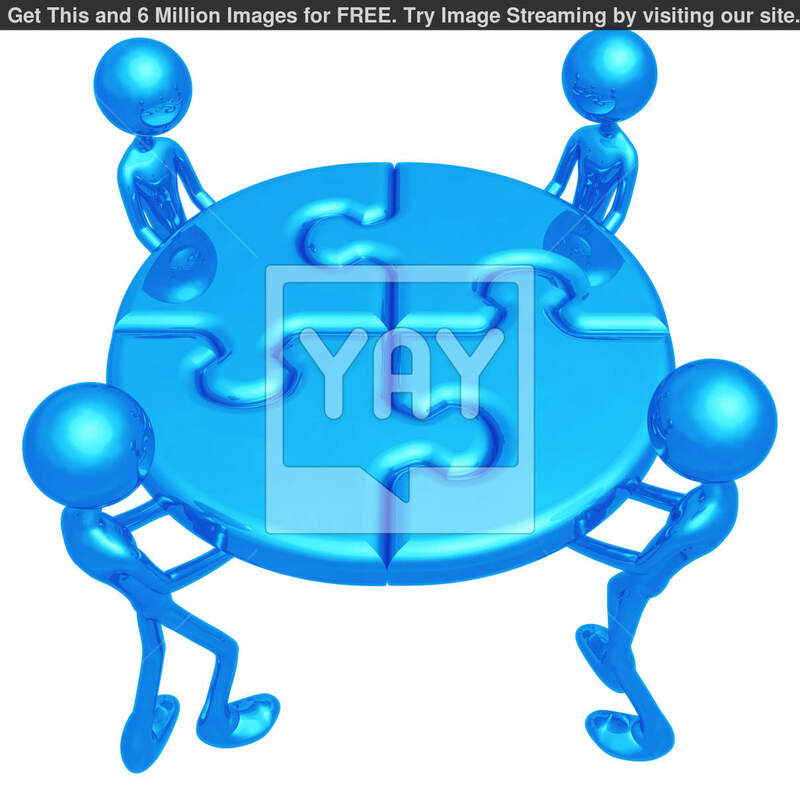 PBL projects should have activities that are TEAM BASED and not INDIVIDUAL. Design elements to include students' voice and choice, critical friends' process and allowing students to manage their work. Student involvement in the development of a project is critical to the success of a project. Multidisciplinary projects can be difficult to design as the main focus of the project should include the two disciplines in all activities. 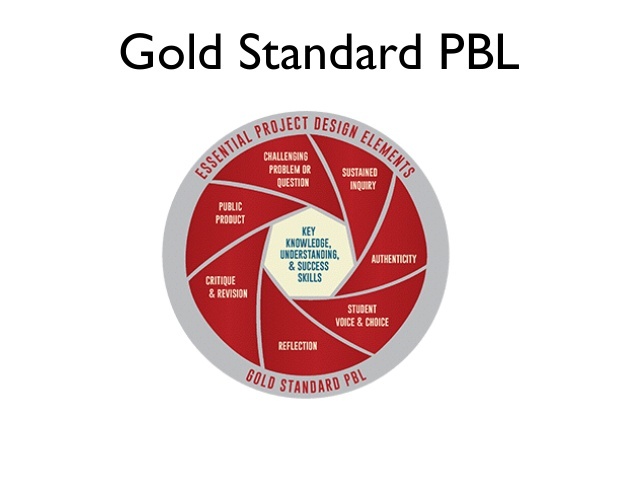 Project design should ensure all elements of Gold Standard PBL is incorporated. Building knowledge, Understanding and Skills is key throughout the weeks of the project. 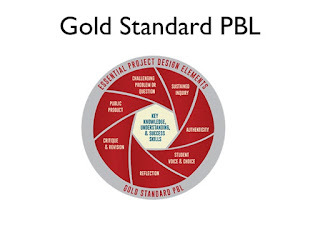 Guided student inquiry will depend on the levels of students and their understanding of the PBL process. Sustained inquiry can come from the activities embedded in the project and not just the list of "KNOWS & NEED TO KNOWS"
Decide on how to approach the process of finding answers to students' questions. For example, the list could be divided among student teams or "jigsawed" expert groups. Some questions might be answered through student research, whereas others might be answered by teacher-provided lessons. Assessment of exit tickets, quizzes, hand-ins etc. Creativity - teachers are not here to assign a grade but rather to guide improvement. Critical feedback required. Point of a formative task is to shift the normal distribution - giving the opportunity to resubmit a task in much better quality. - To focus on individual assessments to grade students after critical feedback. - Allow students to resubmit work wherever necessary. How can we make Project Calendar’s flexible here at PMH?? Within the given time of 5 weeks for a project I find that there is not much of flexibility in Project Calendars. Better planning and incorporation of activities with limited formal assessments will enable teachers to complete projects within the timeframe of 5 weeks. Assessing students on Summative tasks is not really necessary if there are checkpoint assessments in different benchmarks. This way we will mark individual student work in teams and not give the same grades to all in the team. 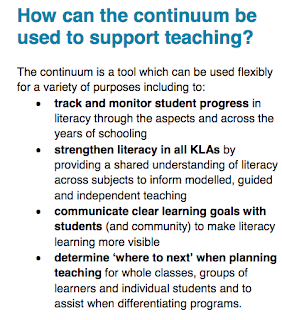 Effective planning is possible from the data gathered in the Literacy Continuum Tracker and it enables teachers to communicate clear Learning Intentions whether it is for a lesson or a Project. The data can be used to create programs with differentiated instruction targeting specific learners. I found assessing student writing and putting them into clusters very challenging as a specific student is put in a higher cluster by another Marker and creates an anomaly in the Clusters students are put in by Markers. I find students' writing is related to a specific subject/content/knowledge of spelling strategies and hence they are grouped in different clusters. Alternatively, it demonstrates the student's ablility to extend his writing and thus justify grouping him in a higher cluster. 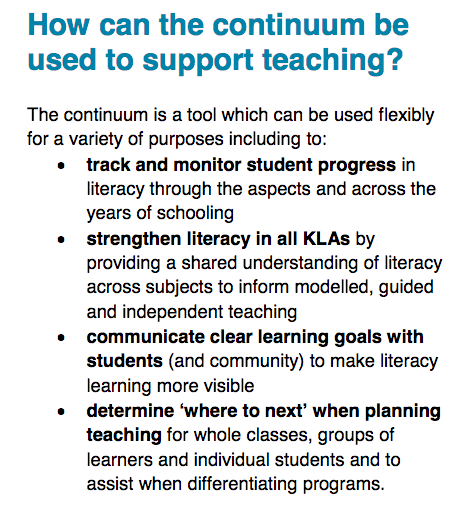 The Literacy continuum has to be an ongoing process throughout the year. 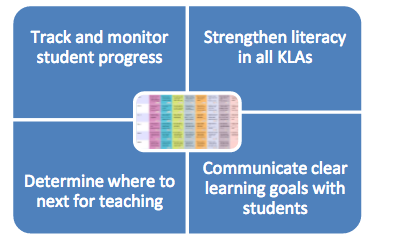 "Each KLA has specific Literacy requirements which students need to master to gain Literacy skills in that area of learning". - spelling specific terminology related to a topic. 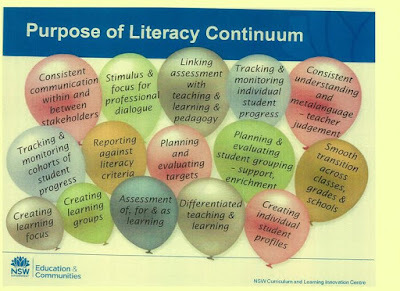 To observe students' progress in their writing and structure PBL projects with a focus on Literacy skills which are requirements of the K-10 Literacy Continuum. To map critical aspects of student writing describing key markers of expected student achievement. Monitor student progress for a specific year group and record it on a "Data Wall" in the staffroom.